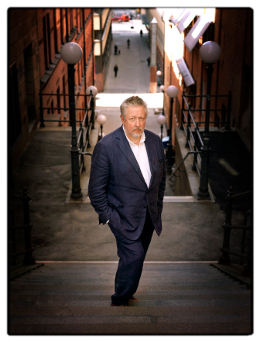 In Sweden we only have a few Professors in Criminology and one of them is Leif GW Persson. Persson has worked as a consultant for the police and state for many years. He is a big TV-personality and has among other things been an expert on the TV-show Efterlyst (Crime Watch) for many years. He is loved by many but not all and some critics thinks he is to macho and arrogant. Undoubtedly he is tough and raw and he writes about a male world but I can´t help but like him and his books. In the late 1970s early 1980s he wrote a police procedural trilogy (The Pig Party, The Profiteers and the Pillars of society) that had a lot of social criticism in them. His style is direct and realistic with a touch of humor and sometimes a very unflattering picture of the Swedish police. His Hero is the very competent policeman Lars Johansson who is resistant to any police corruption. Everything bad in a police man can be summoned in the very incompetent police man Evert Bäckström who is a racist, homophobic, sexist, egocentric, and lazy. He drinks too much, is too fat and is someone you love to hate. Persson did not write a crime novel until 20 years later when he once again wrote about Lars Johansson in another trilogy. The first book from 2002 Between summer´s longing and winter´s end takes place in the 1980s and involves the Cold War as well as the murder of the Swedish Prime minister (The Swedish Prime Minister was murdered in 1986 and we still don´t know who murdered him). The book will be available on Amazon.com from September. Today I got a review copy of his latest book Den döende detektiven (I suspect it will be called the Dying Detective) and I can´t wait to read it. Lars Johansson is now retired and is sick but that doesn´t stop him solving a cold case. I´ll be back with a full review in a couple of weeks when it´s released in Sweden! If you haven´t tried one of his books now is the time to start.